Ambberjack. Studios is at it again. Do not let your wards stay idle this summer. Let's keep their minds and hands busy. They will be going back to school with a whole lot. training Class begins 1st August 2015 and will run through till the 12th of September 2015. 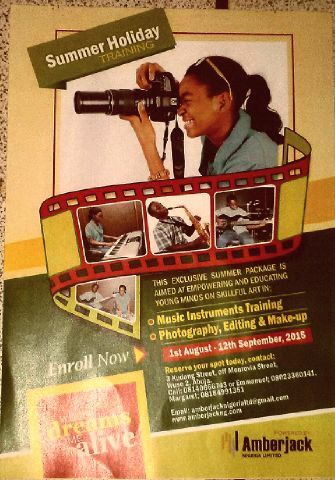 To Enrol or make enquiries Contact us @ No. 3 kudang street off monrovia street off aminu kano crescent, wuse 2 Abuja. Or call: 08023360141 and 08184991351.